Elk Point - Aug. 22, 1804 - The party elects Patrick Gass to replace Sgt. Floyd who had died two days earlier. This marks the first election west of the Mississippi. Vermillion - Aug. 25, 1804 - The explorers go to Spirit Mound, which area tribes believe is inhabited by 18 inch tall "devils". 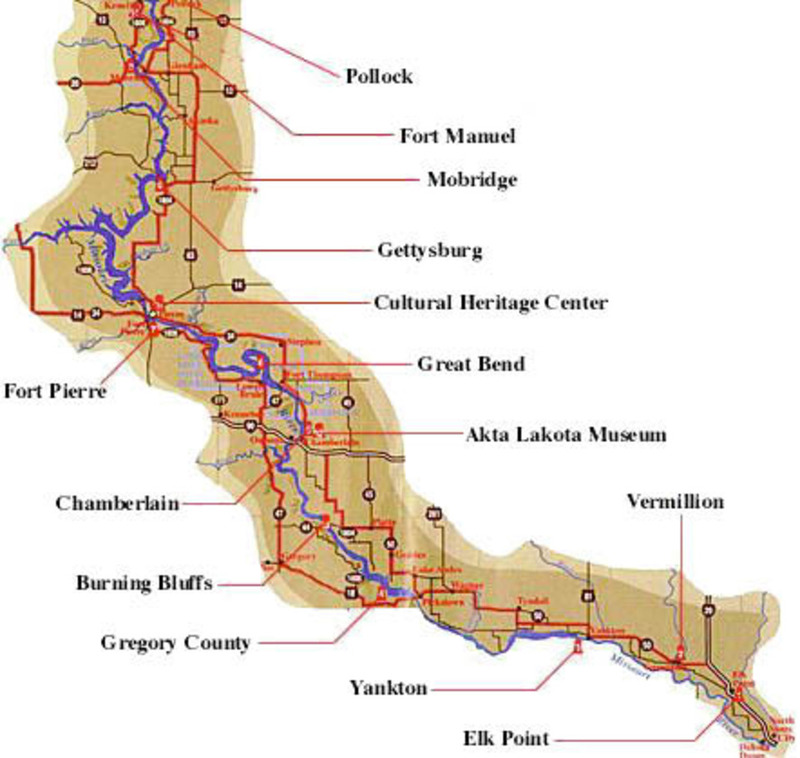 Yankton - Aug. 28, 1804 - The expedition holds a council with the Yankton Sioux at Calumet Bluff. Gregory County - Sept. 7, 1804 - The expedition sees prairie dogs for the first time. All of the men attempt to drown one out of its hole for shipment back to Jefferson. Chamberlain - Sept. 16, 1804 - Near present day Chamberlain, the expedition stops at a place they call Camp Pleasant. In Lewis' journals he describes the numerous buffalo, deer, antelope and elk. Great Bend - Sept. 21, 1804 - Near Present day Fort Thompson, the Corps of Discovery comes to the "Great Bend" in the Missouri. They measure the distance by land, which is a little over a mile, by water it is over 30 miles. Fort Pierre - Sept. 25, 1804 - Confrontation with Teton Sioux, who demand one of the Expedition's boats as a toll to travel farther upriver. Chief Black Buffalo resolves situation before any fighting. Expedition stays with tribe for 3 more days. Gettysburg - Oct. 4, 1804 - A replica of an abandoned Arikara village, like the one encountered by the expedition, stands in Gettysburg's West Whitlock Recreation Area. Mobridge - Oct. 8, 1804 - The expedition discovers three Arikara villages. Days later they hold council with them. Pollock - Oct. 13, 1804 - Pvt. John Newman is charged with "mutinous expression" and is found guilty. He receives 75 lashes and is disbanded from the party. Cultural Heritage Center - Pierre - Lewis and Clark were not the first explorers in South Dakota. Two Frenchmen, the Verendrye brothers, buried a lead plate claiming the region for their king in 1743. In 1913 the plate was discovered by kids and is now on display at the Cultural Heritage Center in Pierre. Akta Lakota Museum - Chamberlain - A baby was born while Lewis and Clark held council with the Yankton Sioux. According to the legend, Lewis and Clark wrapped the baby, named Struck By The Ree, in an American flag. More information about the Great Sioux Nation can be found at the Akta Lakota Museum in Chamberlain. Burning Bluffs - Platte/Winner - In 1804 Lewis and Clark saw bluffs that appeared to be on fire. Today along certain portions of the Missouri River (most recently near the Platte-Winner bridge), smoke and steam pour our of the earth's surface, creating the look of fire, without flames. The burns are unpredictable, but look for them from Fort Randall to Chamberlain. Fort Manuel - Kenel - Sacagawea, who served as an interpreter during the expedition, dies at Fort Manuel of a "putrid fever" in 1812. A historical marker near Kenel stands at the site of For Manuel. In May, 1804, Meriwether Lewis and William Clark set out on an amazing expedition across the Louisiana Territory. These true American heroes faced unknown people, harsh conditions and unexplored lands to secure a place in history as two of the world's greatest explorers. One of the expedition's stops along the way was near present-day Yankton, South Dakota, and the Yankton Area Chamber of Commerce along with the Yankton Daily Press and Dakotan has put together this site to celebrate Yankton's place in history as well as sites along the rest of the Lewis and Clark Trail. Copyright ©2019 Lewis & Clark Historic Trail. All Rights Reserved.